The Moon symbolizes the fertile and sometimes frightening world of the unconscious and the imagination. This is the realm of dreams, visions, fantasies and subjectivity, along with the somewhat negative variation of illusion. In a reading this card points to an excited or enlivened unconscious mind, which may manifest as inspired, visionary creative impulses, strong intuitive impressions, spiritual dreams or terrifying nightmares, depending on the situation. Just as the moon is mutable, changing and inconstant, so the unconscious mind is variable, unpredictable and home to myriad different forms and energies. The dog and wolf pictured in the Moon card represent the animal instincts and appetites that exist within the human unconscious— the “animal” in man. The dog, being domesticated and friendly, represents unconscious instincts to “follow the pack” or fit in, whereas the wolf signifies our more aggressive and unruly aspects which can erupt to the surface of consciousness with a force that even surprises the individual temporarily possessed by the snarling, self-preserving instincts of a wild beast. More generally the two animals represent the parts of our psyche which are not rational and which cannot be controlled, tamed or even affected by reason, as well as the innate powers of instinct which we have inherited from our animal ancestors, but which have been downgraded in value in modern times and repressed into the unconscious. It has been proven, for instance, that a human being can sense if some one is watching him from behind; he can actually feel the gaze upon himself without looking, by way of some sort of sixth sense. There are many such powers which have been passed down from our animal forefathers, which now lie dormant in the collective unconscious; these powers can be accessed and enhanced through ecstatic religious experience, spiritual ritual, dreams or artistic rapture— experiences which belong to the hazy, dreamy world of the Moon. The crayfish, according to Waite, is “that which lies deeper than the savage beast”. The creepy-looking cretin emerging from the swamp represents our deepest collective fears— those which we do not even dwell upon long enough to make clear to ourselves; we just banish them to the watery underworld of the subconscious mind. Yet it is their ambiguity and unfamiliarity, of course, which makes them frightening in the first place. In this way we actually create the demons and monsters that we are so afraid of, by refusing to really look at them. In a reading the Moon card can signify a highly one-sided or subjective perspective, or an active imagination or intuition. Whether this imagination is infusing a project with vision and splendor, or whether it is dissolving and disintegrating a previously stable situation is case by case, and up to the individual in question to determine for himself. The Moon is ruled by the zodiac sign Pisces. Pisces is ruled by the planet Neptune. The Moon card represents illusions, intuition, fantasies, fears, or anxieties in your life. You may be feeling like things in your life are not quite as they seem. You may experience strong dreams or intuitive messages or even feel as though you are slipping into a mental confusion that makes it hard to concentrate. It is also possible that you will feel more in tune with your creativity and imagination and be drawn to mystery or adventure. Now is a good time to channel your creativity and find yourself in reality in the process. When the Moon card is reversed, it indicates that there may be primitive forces at play in your life that will usher in a dark time. You may feel very blocked creatively or sexually during this time. You may also feel the need to withdraw from wilderness and the chaos of the world during this time. 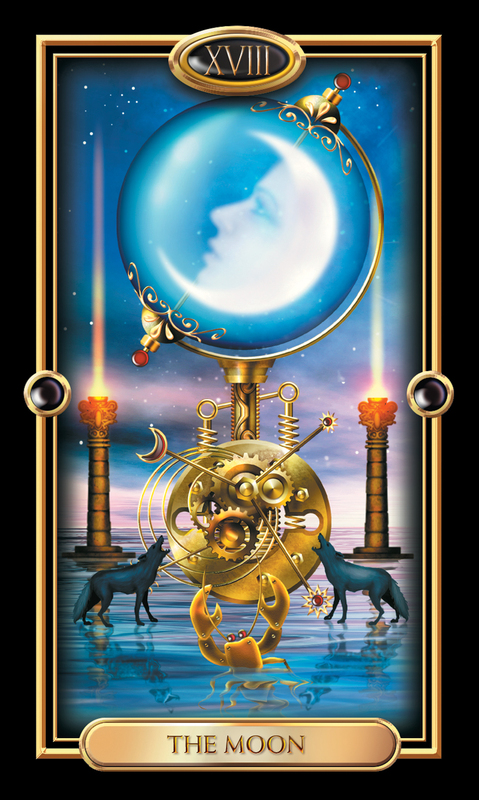 The Moon card can signal an upcoming time of confusion and uncertainty in your work life. You may need to ask question and listen carefully to ensure that you and your coworkers understand one another clearly. Patience will serve you well during this time, and you may need to stay calm under an attack to smooth misunderstandings in the workplace. The Moon card can represent high levels of emotion in your love life and relationships. You may find that conversations become heated easily but it is important to pick your battles and remember to treat your lover like a friend, not a foe. If you are single, now is not a good time to rush into a new relationship. The Moon card signifies a period of patience in your financial life. You may be waiting on a financial decision at the moment, and you likely have to continue to practice patience as you wait a bit longer. If you need to make financial decisions during this time, it may help to rely solely on concrete facts. The Moon card signifies a period of spiritual seeking and healing in your life. Now is a great time to focus on reading, healing work, or group discussions on spirituality. You may be feeling more physically open than usual, and should stay alert and heed any thoughts or feelings that seemingly come out of nowhere.